UF IFAS Range Cattle REC, 8th Annual Youth Field Day in Ona, FL. June 25, 2015. See last year’s flyer. Florida Cattleman’s Association Convention in Champions Gate, FL: June 16-18, 2015. Florida Section – Society for Range Management 2015 Spring Workshop,Osceola Extension Services Workshop, Kissimmee, FL, Thursday, April 23, 2015. Cattle Industry Convention & NCBA Trade Show in San Antonio, Texas: February 4-7, 2015. Florida Beef Excellence Institute: October 14-15, 2013; Contact Rebecca Matta for more information. 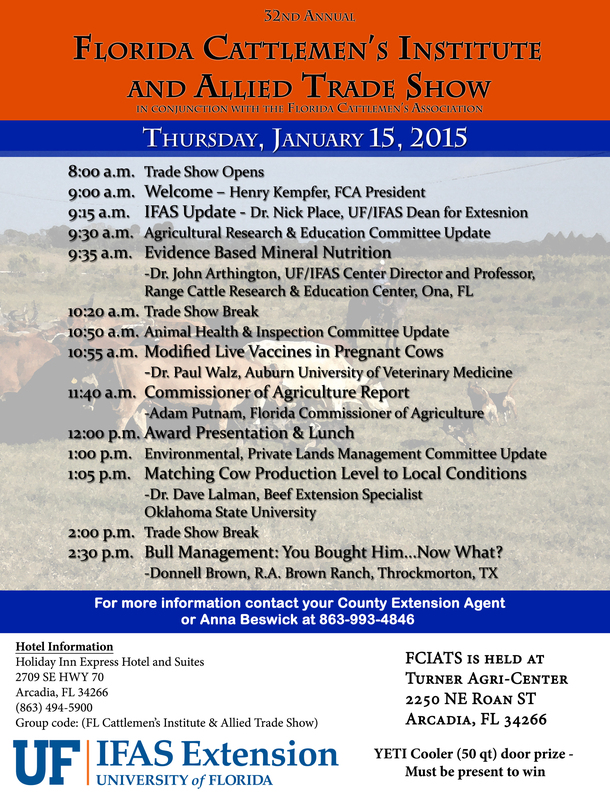 UF/IFAS Florida Fall Cattlemen’s Conference & Allied Trade Show in Ocala, FL on November 20, 2014 8:00 am.